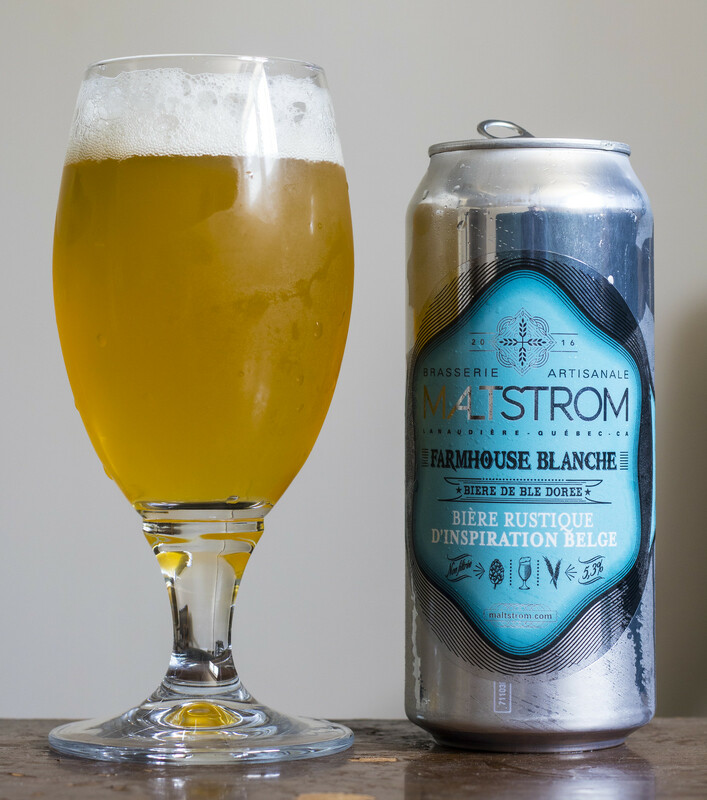 This is the first time I've ever tried anything by Brasserie Artisanal Maltstrom out of Notre-Dame-des-Prairies and today I'll be checking out their Farmhouse Blanche, a rustic Belgian-inspired ale. This is a hybrid beer combining an American Farmhouse, a white IPA and a Belgian saison, dry hopped with American and New Zealand varieties of hops. Appearance: As soon as I opened up the can, there was a liberal amount of foam trying to escape from the top but thankfully it wasn't a gusher like many Belgian-style beers. Pouring the beer in the glass, it is pretty hefty in snow white foam again, but the foam diminishes pretty quickly, leaving behind a really nice amount of lacing. The body itself is cloudy and lemon yellow and has a moderate amount of micro-carbonation taking place, as well as hint of fizziness. Aroma: My initial thoughts on this beer is that it has the aroma of your typical American Farmhouse ale right up front, citrusy and a bit of a barn yard funkiness to it. 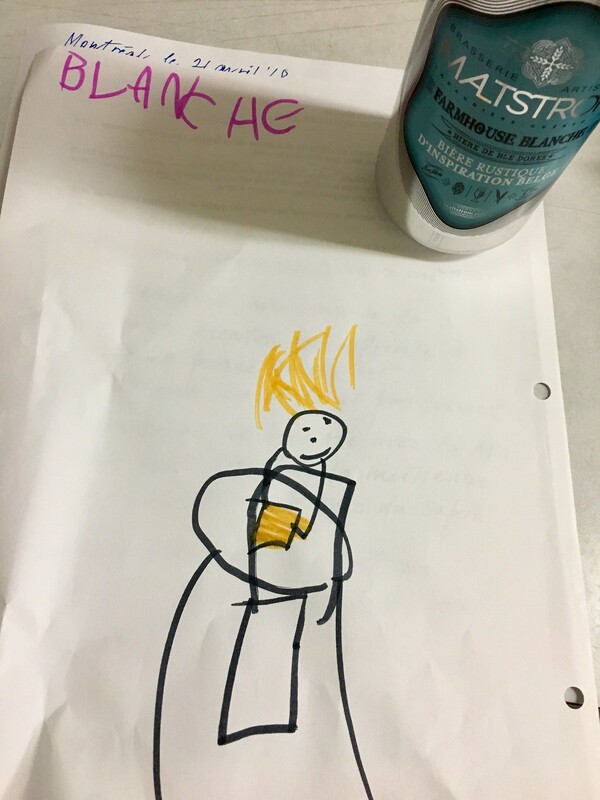 There's notes of lemon, bubble gum, a tad yeasty and a light amount of breakfast cereal. Light amount of sour notes. As the beer warms up, pretty much the same as the initial thoughts. Taste: Starts up sweet with a hint of bubble gum, a bit of tropical fruit, a moderate funkiness that reminds me a bit of a beer brewed with Brett, so it's a bit funky, somewhat herbal, decent amount of grassy notes, a hint of pepper, and hints of lemon and orange peel. Quite dry, very carbonated on the palate, easy to drink. Overall Thoughts: I was expecting this to be a run of the mill witbier but this turned out to be an interesting saison mashup - You get the typical sweet and bubble gum notes that I absolutely love in an old school saison and it's mixed with a newer American style Farmhouse that has more of a funky wild yeast presence to it, so gives off more of a tart presence. Neither style proved to overpower each other so it was quite delightful and easy to drink. Cheers to Alain & Blanche for the awesome parcel they sent me!